"That's Roy Wood's old amp, mate"
My 'career' in the local band scene began in 1986, when one of my colleagues, a normally sensible chap called Darrall, asked me to try out for his newly formed, R.E.M. style janglepop combo. I have to point out that at this time, my Bass playing prowess stretched as far as two Thin Lizzy riffs and the intro to 'Satisfaction', but he was desperate - really desperate. It did involve a trip to the pub however so I reluctantly agreed. It was at the pub that I first met Gary, the drummer. He took one look at my tragic Motley Crue wannabee outfit and decided to get blind drunk. I later found this was not an unusual occurrence. We finally reached the rehearsal room, (Gary had taken the precaution of walking twenty metres behind us so as not to be mistaken for an acquaintance of mine). Down about a million steps, we arrived at a shabbily padded door. As we pushed it open, the sound of six of the crappiest bands in the West Midlands assailed our ears. Gingerly, Darrall asked which of the rooms was ours and without lifting his head from a ten-year-old copy of 'Razzle', the Black Sabbath roadie look-alike pointed to the corridor. As our eyes got accustomed to the gloom, we could vaguely make out a prehistoric drumkit and a few amps. This was not the kind of place Celine Dion would rehearse in. "Don't forget to use the ashtrays..."
About half of our two-hour session involved setting up the gear. 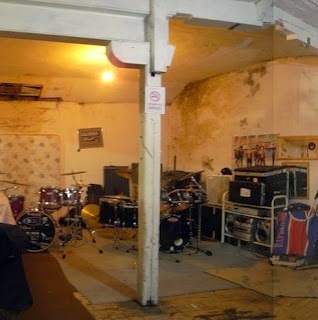 Gary clattered around the kit like an epileptic shed builder, whilst Darrall struggled with what was once a Marshall amp but was now little more than an electric rabbit hutch. The sound that dribbled out of its ruined speaker was like six angry wasps trapped in a galvanised bucket. 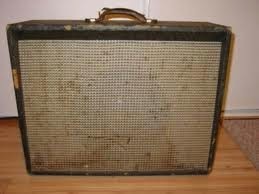 My amp was about sixty years old with perished Bakelite knobs and woodworm. After much farting and spluttering, a sound resembling a forty-foot bungee rope being twanged by an arthritic pixie emerged. We pronounced ourselves ready to rock.